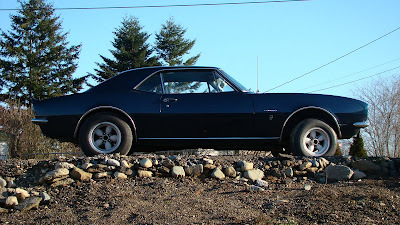 This is where you learn about the 1967 Chevrolet Camaro I purchased in 2007, and the transformation it's going through. This is becoming a real rags to riches story, a lot like Cinderella Man or Pretty Woman, but without the boxing or prostitution. 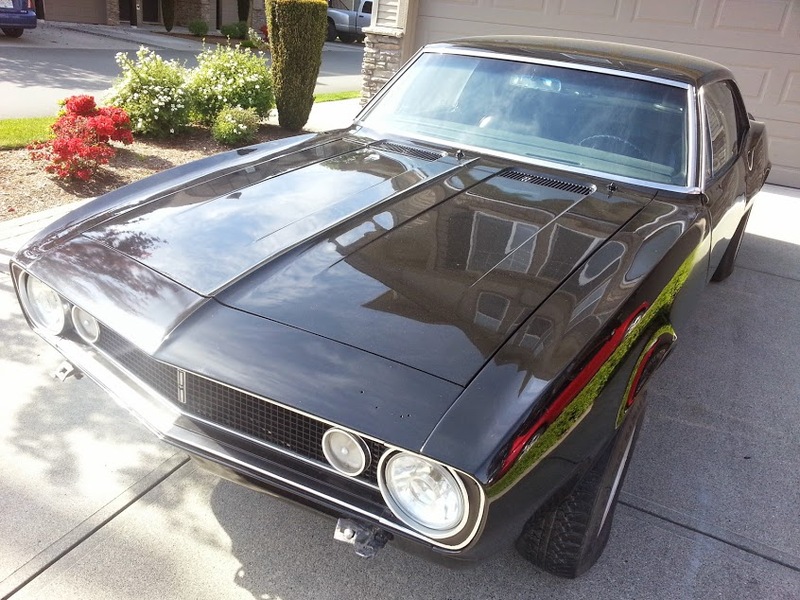 The Camaro was found on eBay listed for just under $10,000US. I live in Canada, so not only would exchange rates need to be considered, but the cost and process of importing a vehicle. Let's not forget we're talking about buying and shipping a 40 year old vehicle from an eBay auction. The auction images were decent, but sceptical eyes weren't ready to settle on just any Camaro. It had to be 67' and no cookie cutters allowed. No V8's, no floor consoles, no fancy RS/SS packages. This was surprisingly tough to follow as most of these muscle cars have most of that. However this auction was for a base model with a 250 inline 6 motor. That means no V8, no console and no options (other than chrome package and rear spoiler). After some discussion with the seller, it was obvious the car needed new paint and may have been in an accident at one point. No matter, this would make a great project car. 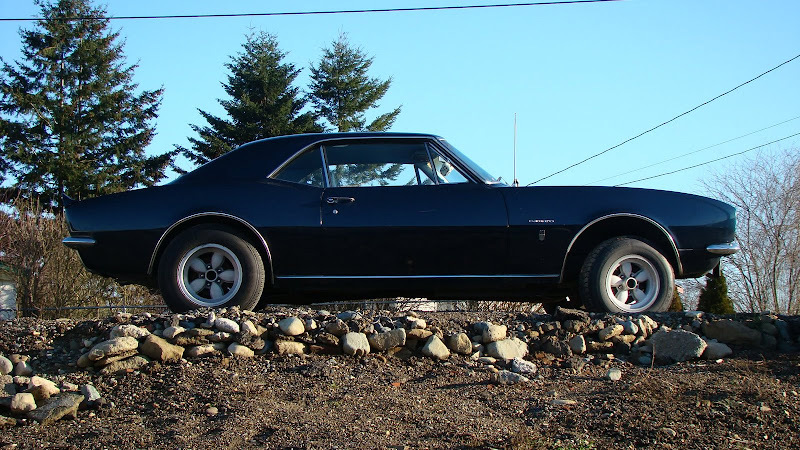 Luckily, the Canadian dollar was actually more valuable than the US dollar at the time, allowing the car to sell for several hundred less Canadian dollars than the asking price. Shipping the car from California to Blaine, WA for about $250 was fairly reasonable too. A few hundred dollars in tax charges at the border and the Canadian insurance permit could be attached. A government forced inspection was completed at Canadian Tire and only new windshield wipers were needed. That's $80 well spent. A quick stop at the insurance broker afforded brand new British Columbia plates for this, now Canadian Camaro. The car was driven home and the peasants rejoiced. At this point, the Camaro was an extra vehicle that occasionally got tinkered with. It was only obsessive compulsive actions that afforded the initial YouTube videos like the oil change and shock swap. There were lingering dreams of eventually getting a new paint job and some kind of power plant but it was more of a retirement goal. In 2013, the car was more or less in storage and any work done was interior related. The car wasn't moving much and lots of time was spent staring at the cracked paint. Some family budgeting was done but there was no way to afford the local price quotes of $5000+ for paint. In a growing family that concerned itself with affording groceries and diapers, paint jobs weren't on the priority list. Until one day when Rolled On Forums was accidentally discovered. The forums provided detailed and proven methods of rolling regular metal rust paint on a vehicle and having them look as good as spray jobs. The first thought was, there is no way it will look good and definitely won't last. So, every page of every project was read and notes were taken. I gained a lot of confidence in the "$50 Rustoleum Paint Job" theory. Since the materials would only cost $200-300 and the rest was just time and effort, the wife gave two thumbs up and it was time to get started. It was at this point Turbo Camaro was born. Sure, there was an interest in turbochargers, but the idea of doing everything "in house" and documenting it for everyone had not been considered. With the paint job completed in 2015 and the engine build currently underway, it seemed like a perfect opportunity to bring as many interested parties along as this classic car goes through a meticulous transformation to a unique, daily driven, turbocharged performance vehicle. TurboCamaro.ca went live in 2016 and contains everything you could possibly want to know about Turbo Camaro. The Build Sheet is the heart and soul of the site. The sheet categorizes everything that has been, or will be done to the Camaro and gives it to you in exclusive videos, instructions and reviews that are actively updated. The videos section is hosted by YouTube and is a significant source of Turbo Camaro information. The Build Sheet contains all of the same videos, but with exclusive photographs and documentation. If you're interested in watching Turbo Camaro go through a complete transformation, check this site regularly or subscribe on YouTube.